In April 1934, numerous U.S. newspapers printed a photograph distributed by the International News Photo agency showing a man flying through the air by means of his own lung power. The man was identified as German pilot Erich Kocher. Captions accompanying the photo explained that Kocher was wearing a device strapped to his chest which consisted of a box and two horizontal rotors. By blowing into the box, he could make the rotors revolve. This created enough suction in front of him to propel him through the air. He also wore skis on his feet as landing gear, and a fin on his back to steer himself. 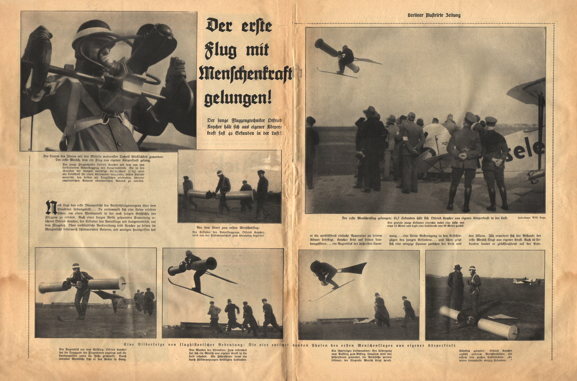 A man flies on his own power for the first time in history: Erich Kocher, wearing a safety costume and blowing into a box to make two rotors revolve, soars from a runway into the air near Berlin. 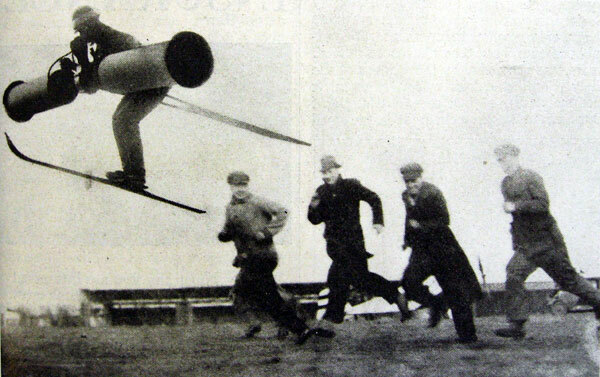 A tail skid attached to his waist steadies him in the air and skis on his feet act as landing gear. Some papers also ran a second smaller photo as an insert, showing Kocher operating the "lung-power motor." 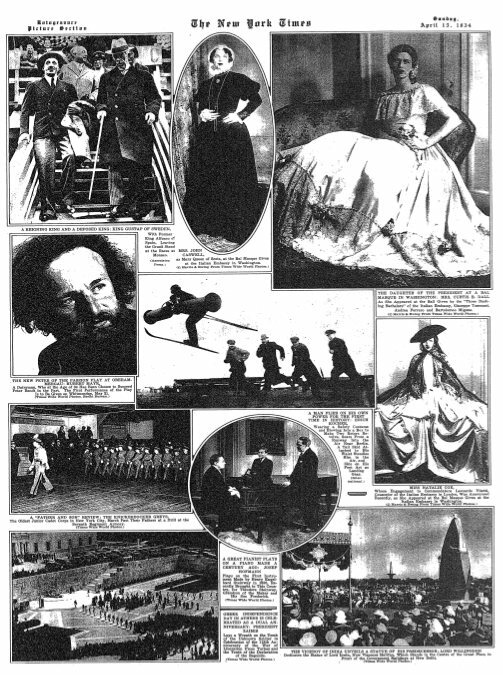 What the American papers didn't realize was that the original source of the photo was the April Fool's Day edition of a German news magazine, the Berliner Illustrirte Zeitung. International News Photo had distributed the photo to its American subscribers without identifying the photo as a joke. International News Photo confused details of the Berliner Illustrirte Zeitung's original article. In the original, it wasn't the force of Kocher's breath that caused the rotors to turn. Instead, the pilot breathed normally into the box, triggering a chemical reaction that extracted the carbon dioxide from his breath and used it to power a small motor. The fact that carbon dioxide is not very combustible and thus would make a terrible fuel was part of the joke. International News Photo also misspelled the pilot's name. In the original it was Otfried Koycher, which was a pun on the German word "keuchen" meaning to wheeze or gasp for breath. The First Human-Powered Flight Succeeds! The young aircraft engineer Otfried Koycher keeps himself aloft almost 42 seconds by using his own body's energy! Der erste flug mit Menschenkraft gelungen! Der junge Flugzeugtechniker Otfried Koycher hält sich aus eigener Körperkraft fast 42 Sekunden in der luft! Der Traum des Ikarus mit den Mitteln modernster Technik Wirklichkeit geworden: Der erste Mensch, dem ein Flug aus eigener Körperkraft gelang. Der junge Flugtechniker Otfried Koycher mit dem von ihm konstruierten Rotorflugzeug mit Lungenantrieb. Die in den Alveolen der Lungen vorrätige Kohlensäure (CO2) wird als Triebstoff für einen kleinmotor verwendet, dessen Energie ausreicht, den beiden als Tragflächen wirkenden, überaus empfindlichen Rotoren elevatorischen Antrieb zu erteilen. Noch liegt das erste Dämmerlicht des Vorfrühlingsmorgens über dem Staakener Uebungsfeld... Da versammelt sich eine kleine erlesene Schar, um einen Wendepunkt in der noch jungen Geschichte des Fliegens zu erleben. Nach einer kurzen Weile gespannter Erwartung erscheint Otfried Koycher, der Erfinder des Rotorflugs mit Lungenantrieb, auf dem Flugplatz. Ohne umständliche Vorbereitung tritt Koycher zu seinen im Morgenlicht silberweiß schimmernden Rotoren, mit wenigen handgriffen hat er die verblüffend einfache Apparatur an seinem Körper befestigt. Koycher steht auf seinen Landungskiern... ein Augenblick der äußersten Spannung... eine kleine Anstrengung in den Gesichtszügen des jungen Erfinders... und schon zeigt sich eine winzige Spanne zwischen der Erde und den Skiern. Jäh erweitert sich der Abstand: der erste Mensch fliegt aus eigener Kraft. Nach 42 Sekunden landet er glückstrahlend auf der Erde. The young aircraft engineer Otfried Koycher keeps himself aloft almost 42 seconds using his own body's energy! The dream of Icarus has, thanks to modern technology, become a reality: The first man has succeeded in flying by means of his own body's energy. 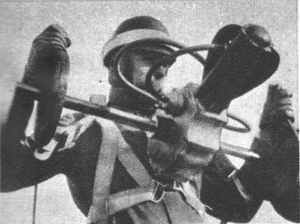 The young flight engineer Otfried Koycher built a lung-powered rotor-flight machine. Carbon dioxide from the alveoli of the lungs is used as fuel to drive a small motor, whose power is sufficient to provide lift to the two highly sensitive rotors, which also serve as wings. Twilight still fills the early spring morning of the Staakener test field … As a small select group gathers to witness a turning point in the still young history of flying. After a short while filled with anticipation, Otfried Koycher, the inventor of the lung-powered flight machine, appears on the airfield. The silvery white rotors shimmering in the morning light require no complicated preparation. Koycher attaches the surprisingly simple apparatus to his body with a minimum of effort. Koycher stands on his landing skis... a short moment of extreme tension ... a small expression of strain can be seen in the features of the young inventor... and already a small gap can be seen between the ground and the skis. The gap abruptly widens: the first man to fly under his own power. After 42 seconds, he lands back on the earth, beaming with happiness. Berliner Illustrirte Zeitung - Mar 31, 1934. The New York Times - Apr 15, 1934. Time - Apr 23, 1934.